Happy New Year! I hope you had a restful holiday break. Ours was quiet, and the temperature was very warm, but it’s getting cold again and we’re expecting a freeze tomorrow. We had a hard freeze in early December (hard for central Texas is 29 degrees), and I didn’t take the time to cover my outdoor plants. That was a big mistake, and I lost a few that I’ve had for several years. 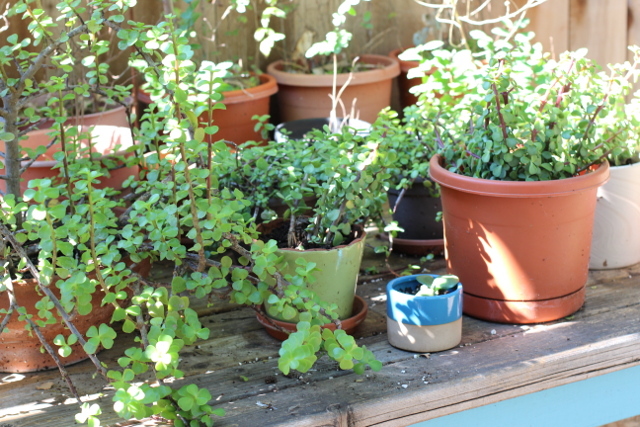 I spent a few minutes today bringing in pots of newly-purchased elephant bush, and I won’t let them get frostbitten this time around. The end of 2016 was busy, as I’m sure it was for you, and I just had to let a few things fall to the wayside, like my poor plants. I’m not one to make resolutions, and I’m feeling very content with my life these days. I’m not blogging as frequently, but I’ve had other things to focus on, which is nice, too. I’m keeping a running list of topics to write about, and I know that there’s a season for everything. After I finished graduate school, I didn’t write for years. But blogging became a daily routine when my boys were very young and I desperately needed a creative outlet of my own. Now that both of my little guys are in elementary school, I have more time to myself each day. The hours go quickly, with errands, appointments, volunteering, and the crazy afternoons of homework and after-school events. Sometimes, I wish I had more time to write, but it will come when it’s time. In October, we adopted a young dog, and she has brought so much happiness to our family in two short months. I never considered myself a dog person before, and we joke that Marnie is part cat because of her size and agility, but now I understand the devotion so many people have to their animals. 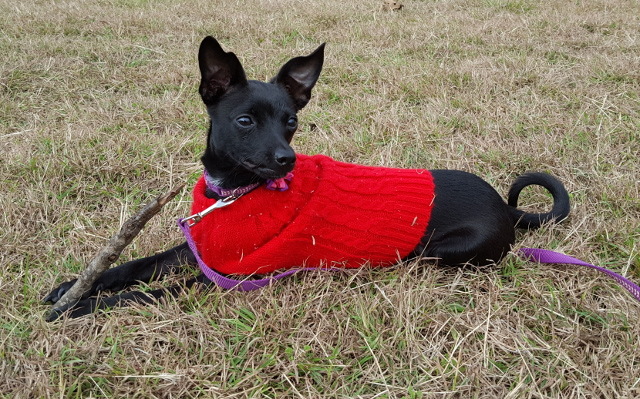 Marnie quickly won my heart, and I spent much of the fall outside, working to housebreak her. She has adjusted to our home and family very well and we are definitely her pack now. I even cut my hair into a blunt bob, like a new mom, because it’s easier to maintain when I’m outside in the heat and humidity. Over the holiday break, I read a few interesting books and watched some fun documentaries, and I hope to write about them soon. I’m making a real effort to buy less clothing this year, and I’ve got my daily uniform perfected. But I love supporting ethical brands and learning about sustainable trends, and I’ll be profiling some as we move into spring. I’ll also continue to review beauty products for EcoCult, and I’m hoping to write a series about my personal favorite products, too. All in good time, I guess. I hope your break was restful and your January is off to a good start. See you soon. I’m glad you’re all doing well! Marnie is adorable. Thank you! Hope you and your sweet family are well, too!